It is difficult to find anywhere in Britain’s town and city centres without CCTV. There are few shops, banks and railway stations without them. Yet, whilst it might seem that big brother is watching you, this is unlikely to be the case. With a typical control room having a small number of operators monitoring the output from a hundred or so cameras, the chances of anything untoward being detected in real-time are slim. In practice, CCTV is used to find out what happened after an incident. Keith Gillespie of Panasonic System Solutions Europe (PSSEU) considers that, with 99 per cent of current use of CCTV being reactive, there is a need for more proactivity. He also points out that CCTV is not just about surveillance as there are many other possible applications, for example people counting. Keith explains that PSSEU has been formed to enable companies to make the best use of the types of hardware that Panasonic provides. Its approach is to identify problems that can be solved and then find matching solutions. However, he emphasises that there is no absolute requirement to use Panasonic products. In this respect, PSSEU has an approach which is technology agnostic. The solutions offered by Panasonic are quite common in other sectors such as retail, banking, museums and events. However, the rail industry has only just started to use these techniques. As an example, Keith describes an advanced security system at a manufacturing facility. This has one hundred cameras, which are selectively displayed on eighteen screens monitored by two operators. 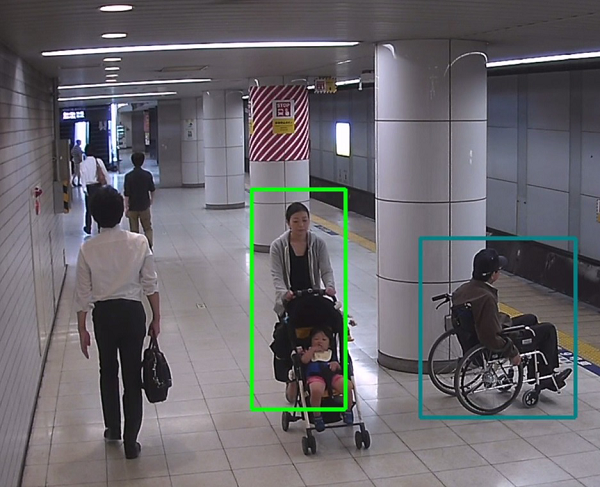 The output from these cameras is analysed by pattern-recognition algorithms to identify any abnormal activity. In this way, operators are alerted of all potential risks, which would not be possible by two individuals constantly monitoring the output from a hundred cameras. To explore potential use in the rail industry, Panasonic Solutions arranged a forum last November with attendees that included nine train operators, Network Rail and the Department for Transport. The forum’s aim was to identify the priority issues that Panasonic could address. The three most important issues were: keeping the railways safe for people, making better customer decisions in real time and dynamically changing capacity. Suicides are both a tragic loss of life and a cause of great distress to all involved. Sadly, there are around three hundred each year on the main line and underground networks. In addition, a further 1,200 or so individuals each year are restrained by either front line staff or members of the public from taking their life on the railway. British Transport Police and the Samaritans are involved in several worthwhile initiatives to reduce this number. These include staff training and press guidelines to avoid copycat suicides. There were also 8,265 railway trespass incidents last year. This is 24 per cent more than five years ago. Each year around twenty trespassers are killed. Together trespass, vandalism and suicides account for a third of all train delays. The safety and security of passengers and staff at overcrowded stations is a challenging issue. Behaviour that leads to security incidents needs to be detected whilst avoiding disruption from lost and abandoned luggage. Potential issues from those under the influence of alcohol also need to be detected. Sixty percent of staff assaults are by those under the influence and, in the past decade, sixty percent of fatalities on the railway were alcohol related. In addition, there is the requirement to ensure the safety of vulnerable or at-risk individuals such as young children, those with disabilities and those who are elderly or pregnant. Panasonic’s trespass warning system has now been in use at a station in North East England for a year. Another is operational at a busy commuter station in the South East. These use a combination of day/night cameras, which operate in the infra-red spectrum at night, together with thermal cameras which are needed to confirm the number of individuals in an image pattern and so avoid false alarms. Smart security algorithms take account of both behaviour and location (such as at a platform edge) to recognise likely trespass and suicidal activity, security incidents, drunken passengers, abandoned luggage and other potential problems including crowd control. When such incidents have been identified, a pan, tilt and zoom camera will capture the activity at a high-resolution and generate an alert so that appropriate action can be taken by staff who have been given intervention training. For potential trespass incidents, the individual concerned is advised not to go on the railway by an automatic audible warning. 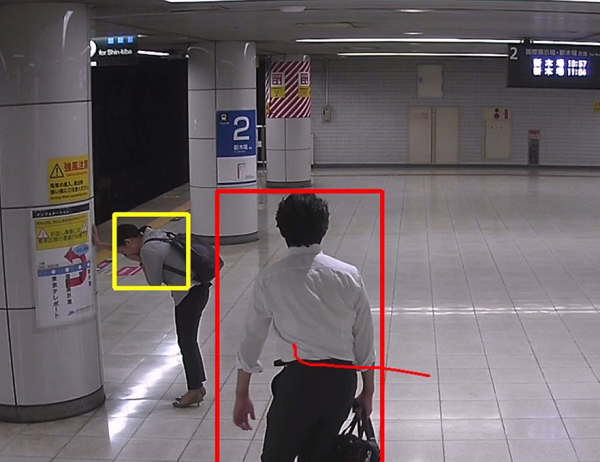 Facial recognition technology is also used to identify repeat visitors who linger at a station, which is an indication of a potential suicide or other incident. The system includes face-masking technology to protect the identity of railway staff and passengers. This can be de-activated if authorised individuals need to review footage following an incident, thereby addressing one of the new requirements of the forthcoming General Data Protection Regulation. Panasonic’s smart CCTV technology has also been used at level crossings for people counting, trespass alerts and gathering of intelligence on behaviour at crossings. This does not suffer from the problems of conventional analysis cameras, which can generate false alerts caused by other moving objects. In remote areas, the CCTV equipment is powered by a Panasonic hybrid off-grid solution which uses solar panels and batteries, such as that provided for GSM-R repeater at Worlaby (issue 149, March 2017). Passenger wayfinding by interactive displays is a further use of Panasonic technology. In the medium to long term, the use of drones to patrol lines automatically is being considered. As with on train surveillance, this application would require a reliable wireless video technology such as that provided by Vislink (issue 155, September 2017). Another potential application is monitoring train doors during station departure. Currently, whoever checks that the train doors are clear does so thousands of times a year, almost always without incident. In such situations, human beings, be they a guard or driver, are prone to “look but don’t see” errors, and so may not notice the rare occasion when someone is caught in a door. Pattern recognition analysis of the output from on-train video door cameras could reliably detect passengers trapped in doors and potentially eliminate trap and drag incidents as trains depart. Introducing proven new technologies from other industries is a way to accelerate rail innovation, especially when, as in this case, the system just observes the surrounding environment and so has no interface with railway hardware that may present operational, safety or reliability issues. It is, however, a technology that needs to be properly integrated into operational procedures, backed up with the required training. With passenger numbers on an already overcrowded railway predicted to increase, the need to manage behaviour, unpredictable events and capacity becomes increasingly important and technological innovation has to be harnessed to manage such issues across the industry. Keith Gillespie is looking for more solutions. He considers that this technology offers huge potential and is keen for the Panasonic team to engage with companies throughout the rail industry to help develop solutions to their needs and provide support, from definition right through to installation and integration. He feels this is best done by a collaborative approach where information is shared, rather than working in silos. Does this all mean that big brother will be watching you? For most people, who will benefit for improved safety and security and reduced disruption, the answer is no. The answer is only yes if you are acting suspiciously!